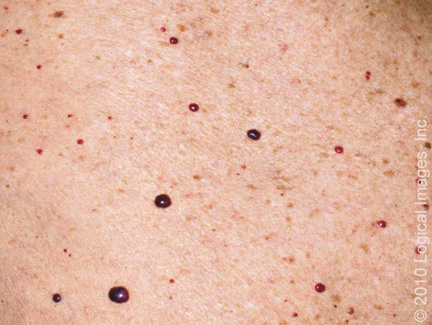 Skin Tags (fancy name, Acrochordon) Single or Multiple pedunculated lesions on narrow stalks. 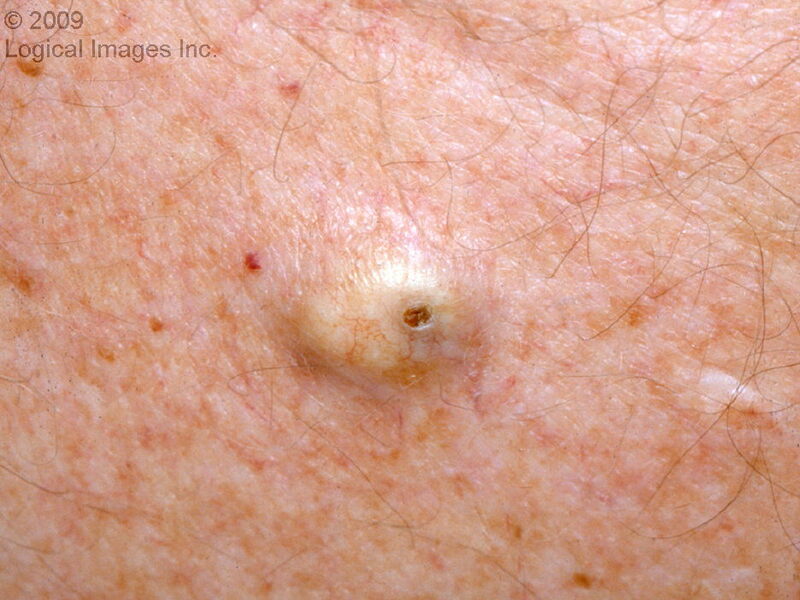 Often grow in areas of friction: neckline, axilla, inframammary regions. Easy to remove, but bleed freely. Dermatofibromas Firm, hyperpigmented lesions, most commonly on lower extremities. Made of benign proliferation of fibroblasts. Dimple when the edges are pinched together (nevi don’t do that). Can recur if removed, sometimes the scar looks worse than the original lesion. Neurofibromas We are used to thinking about 100s of lesions in patients with NF, but can occur as sporadic lesions in healthy adults. 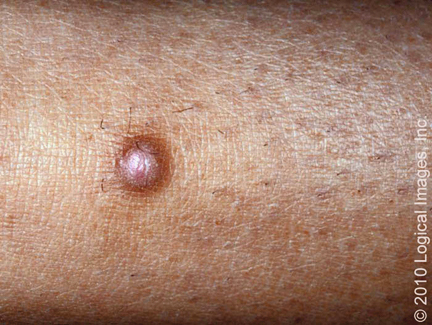 Soft, usually flesh colored papules- less than 3cm. Some will retract when pushed (Button-hole sign). 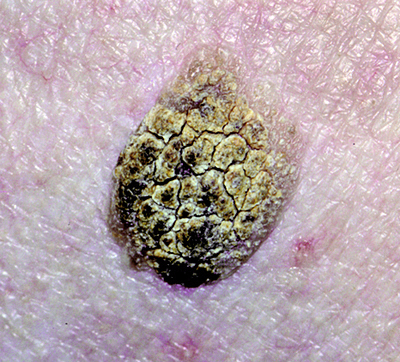 Seborrheic Keratosis Hyperpigmented, waxy, “stuck on” papules. Often warty or scaly in appearance. Looks like you could just scrape it off. Don’t forget the “sign of Leser-Trelat,” which is the sudden appearance of 100s of SKs, acrochordons, and acathosis nigricans. This is associated with underlying malignancy, often lung or GI. Epidermoid Cyst This is the all too common “sebaceous cyst.” It is actually a cyst of normal epidermal tissue that has somehow gotten down into the dermis. 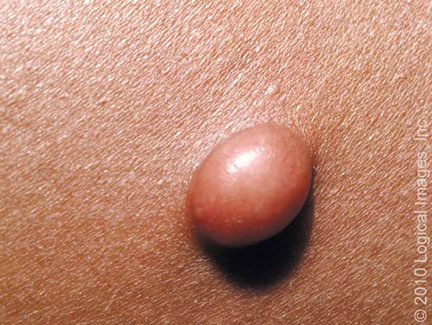 The cyst is filled with keratin produced by the epidermis- not sebum. There is often (but not always) a punctum, and the cyst can drain a thick, cheesy, foul smelling material. They can become inflamed or infected. 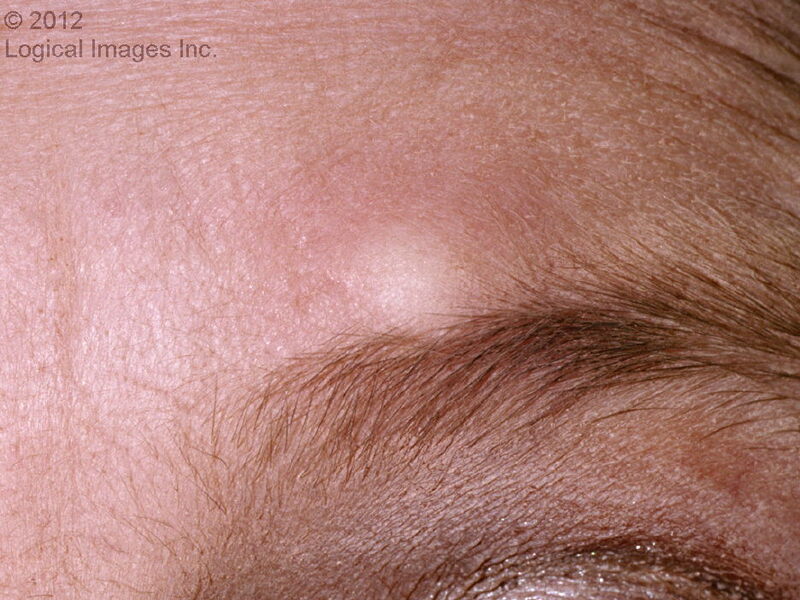 Pilar Cysts These come from the hair follicle, often grow on the scalp. They are filled with keratin, may not have a punctum. They tend to calcify and feel very firm, more than epidermoid cysts. They get tender if they rupture. 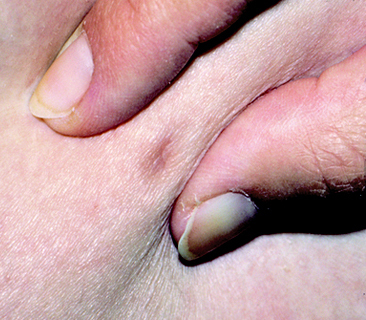 Pilomatricoma Probably come from certain cells in the hair follicle. 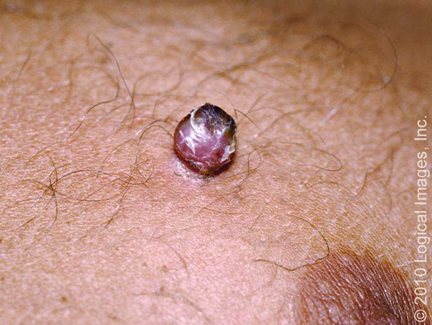 Smaller than Pilar cysts, often bluish or reddish discoloration. These can also become calcified and feel quite hard. Cherry angioma Capillary proliferation, most commonly found on the trunk. Dome shaped, blanch with pressure. 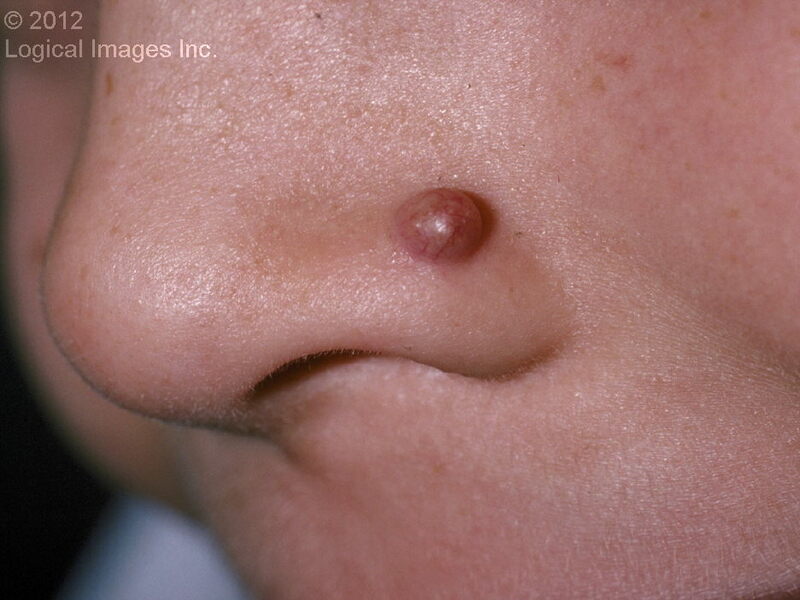 Pyogenic granuloma can occur on skin or mucus membranes, grows quickly and has a friable surface that bleeds profusely. Bigger than cherry angiomata. Lipomas collection of mature fat cells. Often looks like a “ball” under the skin. Is soft, not painful, slow growing. Biopsy if it is painful, restricts movement, or is growing quickly. 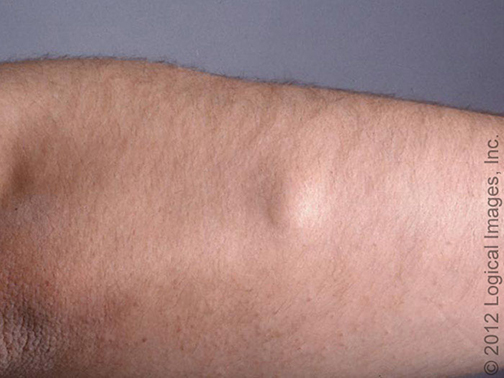 Angiolipoma Looks like a lipoma, but is a collection of fat cells and capillaries. These may occur in groups, and are painful. May occur in HIV patients after starting anti-retroviral therapy. Dermoid Cysts I gave these their own category. They are embryonic remnants of skin formation- with epithelial, glandular, and hair elements, and may communicate with the central nervous system. They occur along the embryonic lines of cleavage. 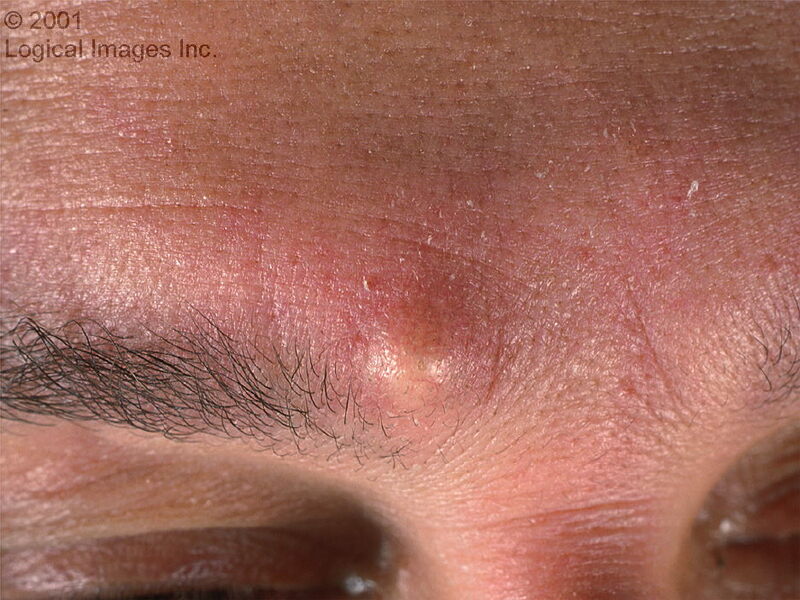 Most common spot is on the eyebrow, also on forehead, scalp, floor of the mouth. 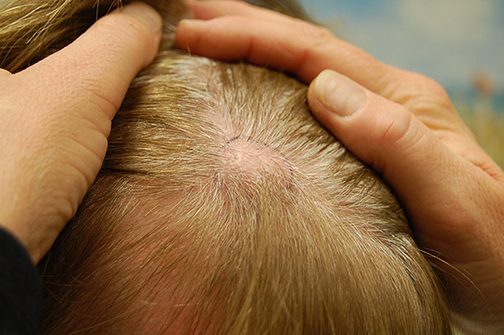 As these may communicate with the CNS- don’t attempt to excise scalp lesions without imaging. Well, nothing like trying an interactive post when your blog is not accepting comments. Not sure what is happening there, but I’m working on it. I am choosing to believe that many have made comments that have been lost into the internet ether. So, until I can get comments back, please let’s try that a different way. Recall our obese, diabetic patient who wants to start an exercise program. -Does he need a stress test before starting? Does he need anything before starting? -Can he jump right in to Crossfit? What is your advice for beginning an exercise plan? Please share, I’ll compile the most interesting comments and share back with the rest of the readers (lurkers). You can deliver your thoughts via email (Erin Snyder UAB Email is fine), page, tweet (just let me know by including @ihaterashes, or you can DM), or this google docs form.